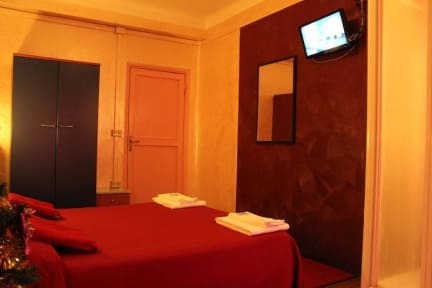 Hotel America is situated in a top and strategic location, in one of the beautiful street of Milan, full of shops, stores, and clubs. This excellent position, optimally served by bus, tram and subway, allows reaching important places of the city in few minutes, like The Central Station and the down town, where there is the most important monument of Milan: The Dome. 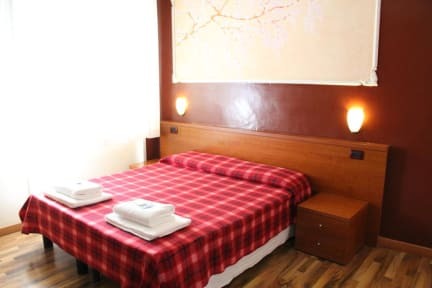 The Linate airport is only 7 minutes far from the hotel. The Malpensa and the Orio al Serio airports are easy connected to the hotel area. Rooms are wide, well cleaned with good furniture. Hotel America allows you to stay in a top location with cheap prices. We have a 24-hour reception . Please note we have a 48-hour cancellation policy. No-shows and late cancellations will be charged for the first night of their stay. We choose America hotel because one of my friend recommend me. Staff Angela and Alex treat us as a old friend. Room was clean and Wifi was fast. 20 minutes walk from the cathedral duomo. It was a lovely stay in Milano. nothing bad. recommend . It was an excellent place to stay. We could walk to the city center in about 20 minutes, if needed. The tram and bus stops were right in front of the hotel. It may seem a bit out of the way, but it's located just across the street from the bus which will take you straight to the Duomo. Also, Angela is an absolute sweetheart! Nice place. It was very clean. We had our own bathroom, which was also very clean. Also had access to the elevator since the hostel was on the 4th floor and we had luggage. Place was a little out of the way and a 30 minute walk to city center. Staff was incredibly helpful! The staff is very nice. The room is spacious amd relaxing. There is a bus station nearby to almist everywhere you want to be, e.g. airport shuttle terminal, attractions. We liked our stay there. Plus: toilett clean, staff was very polite, room was big and cosy. Location was okay. Minus: it was on floor 4, so everytime we had to ring a bell, they would just let everyone in, not ask question or anything, and give the key to them. It was not that secure. It is Milano and everything is quite expensive, so my boyfriend and I understand that prices are high for what you actually get. The staff speak litlle and poor English. Breakfast means sandwich with a piece of salami, mayonaise and piece of salad, two boiled eggs and a coffee. The hotel is 20-25 min of speed walking from city centre. The reception is 24 hour. There is an elevator. Poor lightning and bad working tv in the room. the hotel is on the 4th floor, but the lift is not working, so we had to take the stairs to the 4th floor with the luggage, which is bad. also, i travel with my parents, and they quiet old to take stairs to 4th floor. The woman at the reception was very friendly but didn't speak proper English. No private bathroom, no breakfast and walls as thin as paper.